I just installed new blue leds and found out that it wont pass throught the red film. so i took it apart and didnt work so i put everything back on and the gauge needles are not working right. i would start it up and gauges are not in the right place. tach is at 0 rpm when i turn it on, gas is at empty when its suppose to be full, oil,battery,nor temp are working. any help on what it can be? you have to sand off the red film then theyll show through. did you use leds or standard blue 194 bulbs? how easy was it. yeah i already got the red film out and was a pain. I used leds and was quite simple to install until i got to this point. Well i got the oil and temp gauge to work normal the fuel and battery are where they are suppose to be but in like a min it drops. 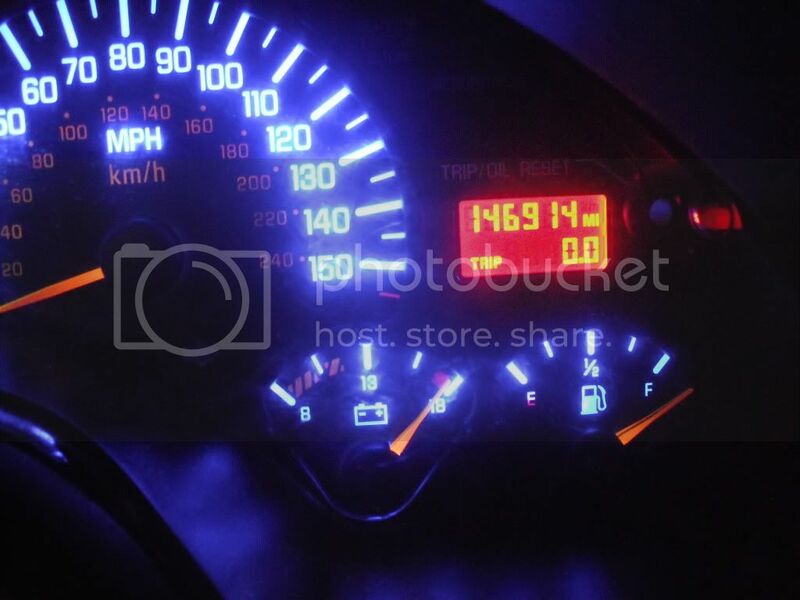 The tach reads 5 grand at ide and the speedo reads 120 in park? checked the gauge fuse and is ok, dont know where the relay is? Half my gauges not working, half the warning lights lit up!